High power and low weight has been a winning recipe since the Jurassic period, when early humans discovered that the lighter and more nimble Velociraptors had a distinct performance advantage over their chunkier Tyrannosaur cousins. Fast forward to the horsepower wars of the Sixties. Dodge offered its brontosaurian 426 Street Wedge engine in the D100 and D200 starting in 1963, and Chevrolet shot back with a big block 396 in the CST 10 just a few years later. 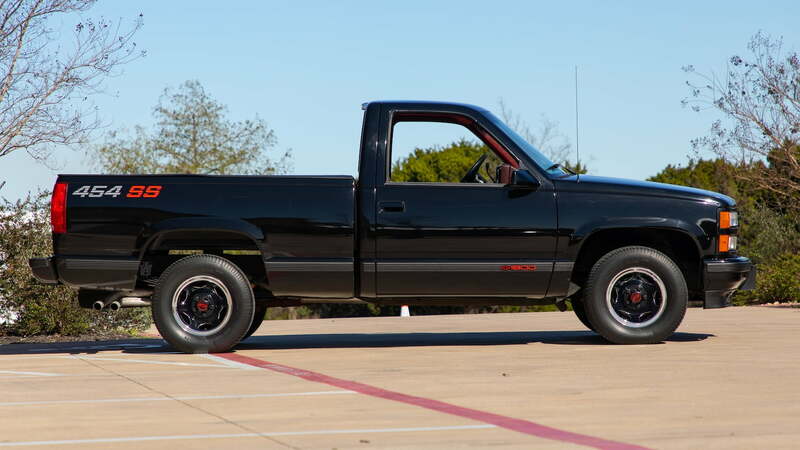 In 1990, Chevy upped its game by stuffing a 7.4-liter (454-cid) V8 under the hood of a single cab/short box 1500, thus creating the 454 SS. 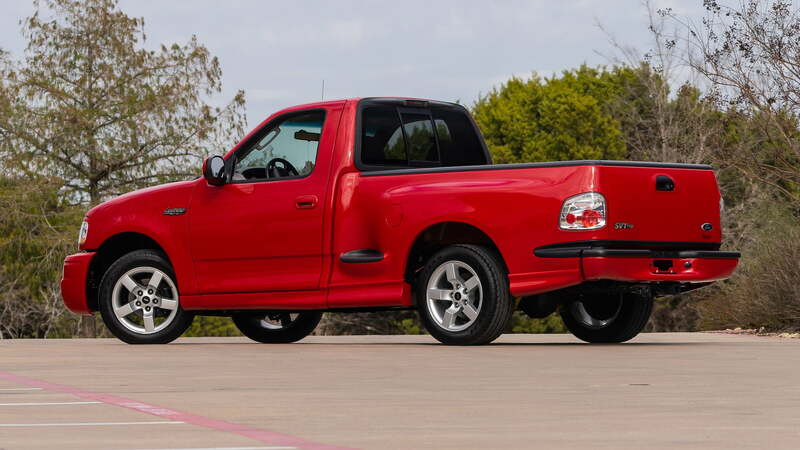 Not to be outdone, Ford released its Lightning pickup in 1993 with a 5.8-liter V8. 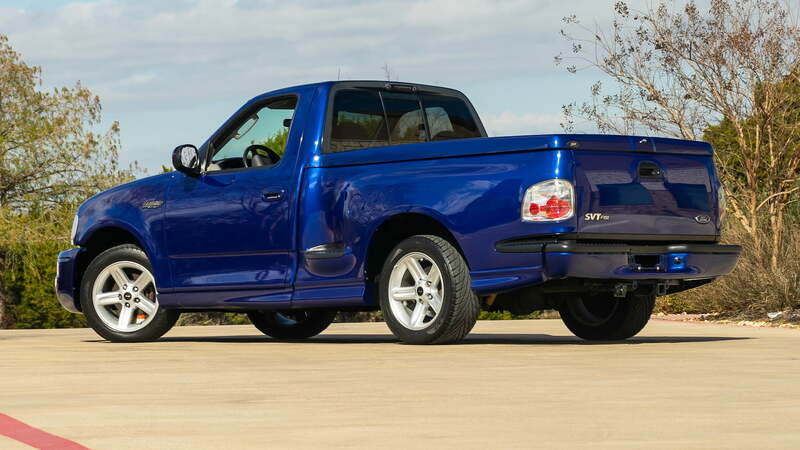 The Blue Oval released a new version of the truck in 1999 with a supercharged 5.4-liter V8, and created a legend. 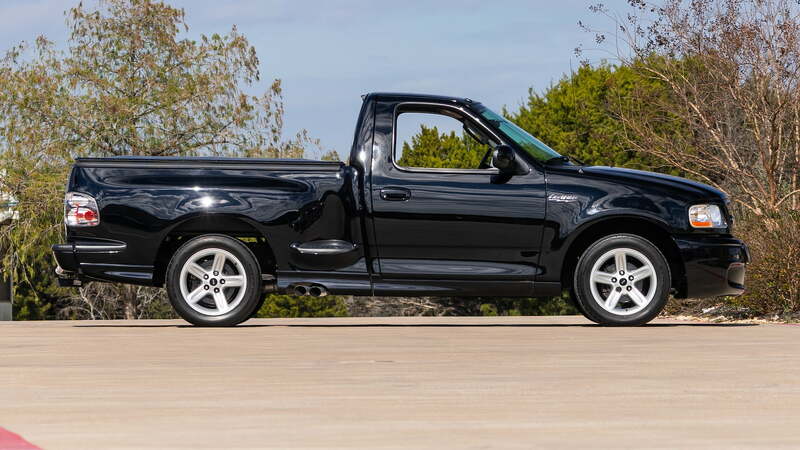 Mecum Auctions will be celebrating the Chevy 454 and Ford Lightning at its Houston event, April 4-6, with “A Collection of Special Performance Pickups.” A dozen well-preserved, low mileage examples will cross the block at the NRG Center, offering enthusiasts a rare chance to get behind the wheel of these rare trucks. Here’s a preview of the lots being offered. Only 3,781 Lightnings were produced in 2004, and just 648 of those wore the red paint of this one-owner example. The supercharged 5.4-liter V8 is original and makes 380 horsepower and 450 lb-ft of torque, and is paired with a four-speed automatic transmission. Even with insane power on tap, this Lightning still offers the convenience of air conditioning, power steering, power windows, and power mirrors. Amazingly, the odometer shows just 2,251 miles. 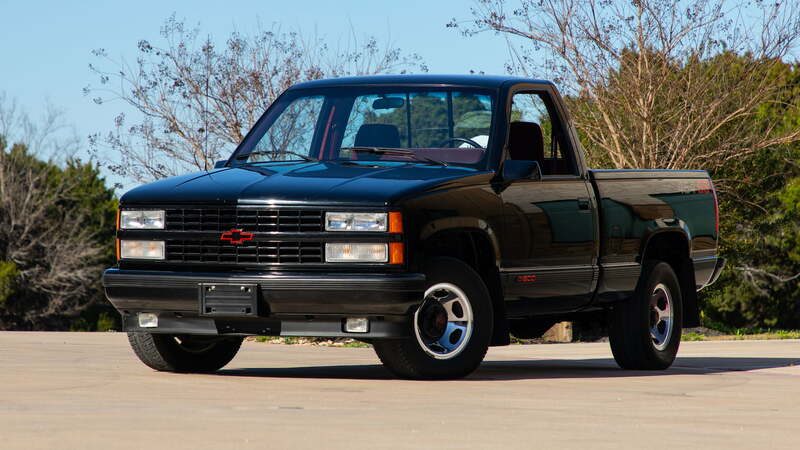 1993 was the last year of production for Chevy’s 454 SS bruiser and just 843 were built. This example wears its original paint and shows just 49,688 miles on the clock. Though horsepower was a mere 255, the 7.4-liter (454-cid) engine made a stonking 405 lb-ft at 2,400 rpm. Sale includes a clean CarFax report. Sonic Blue replaced True Blue for 2003, and just 723 out of a total production run of 4,270 wore the color that year. The five-spoke wheel were also new, and payload jumped from 850 to 1,350 pounds. This example has covered a mere 30,571 miles since new and come with an SVT Certificate and clean CarFax report. This final year 454 SS wears factory Victory Red paint and shows just 40,457 miles on the clock. The 454-cid engine is original and presumably just as thirsty as it was when new, getting just 12 mpg city and 16 highway. We assume that incessantly stomping the throttle to light up the rear tires may have depressed those figures even further, but its well worth the giggles. 2004 was the last year for the Lightning, and just 3,781 were produced. 648 of those wore Dark Shadow Gray paint (the auction catalog states the 2003 figure: 1,170). The 5.4-liter V8 used an Eaton supercharger to make 380 horsepower and 450 lb-ft of torque, and pushed the step side into the record books as the world’s fastest production truck of its time. This example has seen 53,493 miles and wears original paint. All the interior amenities are in working order and the sound system has been upgraded. 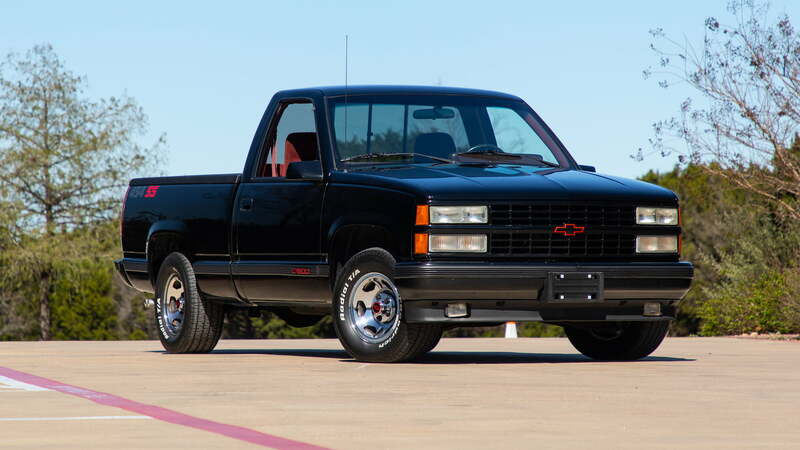 The big block 454 under the hood of this midnight beast was bumped to 255 horses and 405 lb-ft of torque for 1991. A four-speed transmission was new and, out back, a 4.10 gear replaced the previous 3.73. 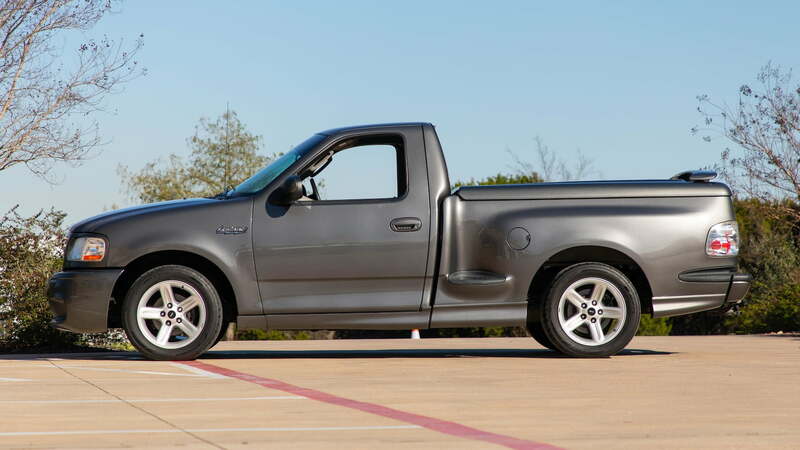 The combination must have made for some seriously tire-shredding burnouts given the truck’s low weight over the rear axle. 983 examples were produced for the year. This one has shows 58,965 miles and has been in the same family since new. 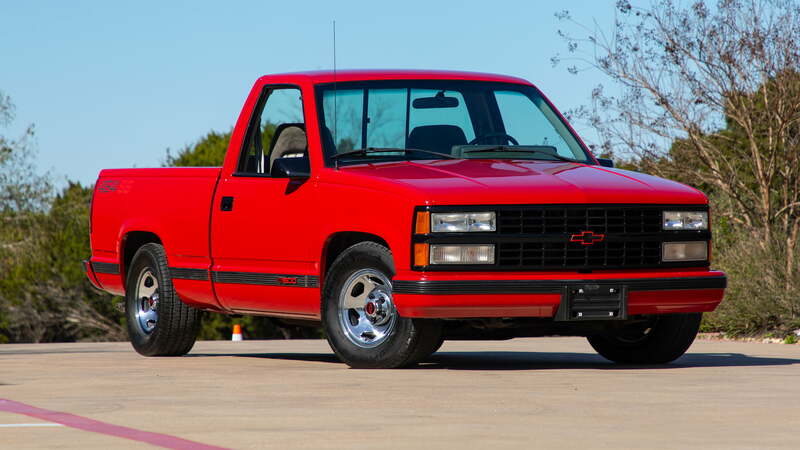 In the first year of production, Chevy produced 13,748 examples of its hot 454 SS pickup. Over the rest of production run (model years 1991-94), just 3,205 were sold. The 454-cid V8 made 245 horses and 345 lb-ft of twist and was paired to a three-speed automatic. 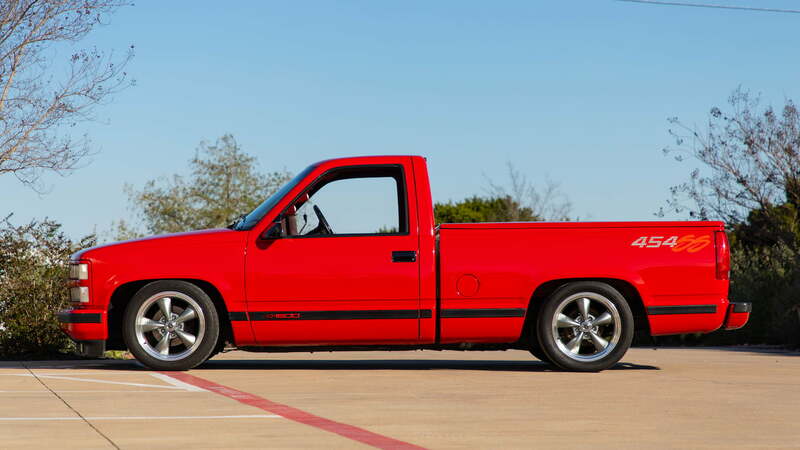 This one-owner truck comes with factory documentation and 454 memorabilia. It’s all-original and shows just 11,711 miles on the speedo. 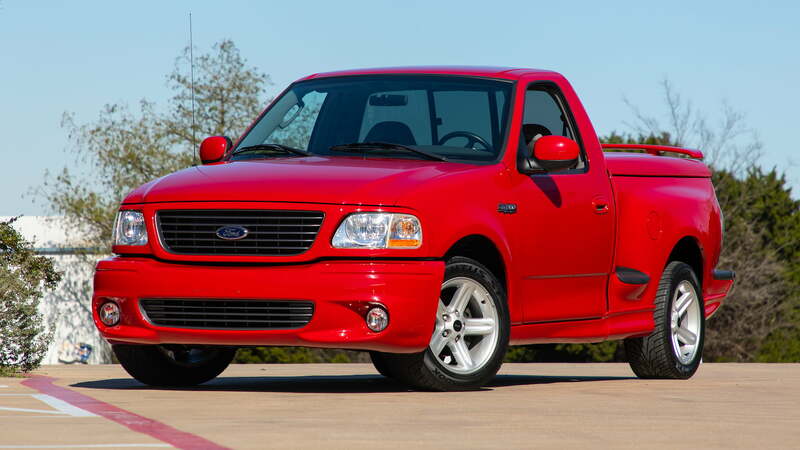 This 2002 Lightning has so few miles—just 1,866—it still rides on the original tires. 4,726 of the supertrucks were produced in 2002, and 1,086 wore the Bright Red paint (that’s really what Ford named the color. We checked). Power windows, mirrors, and steering are all in pristine shape, and the sale includes the original window sticker, SVT certificate, and CarFax report. 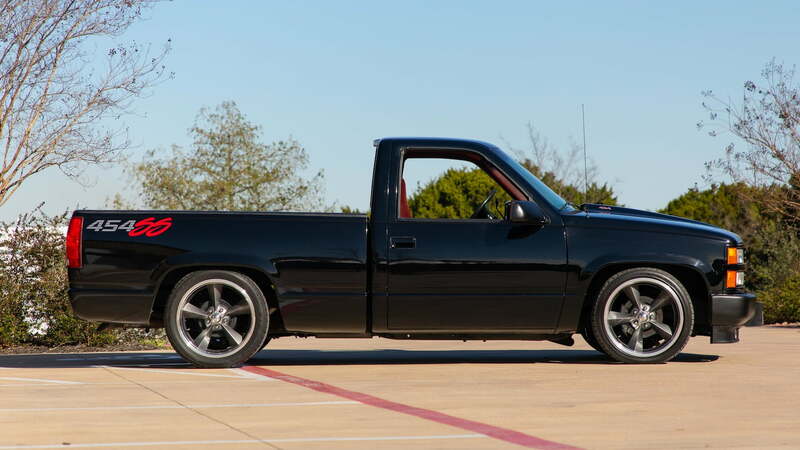 Another incredibly low mileage muscle truck, this 454 SS has seen just 5,450 miles since new. The optional bedliner was installed by the dealer, and the cassette player is straight from the factory (remember cassettes?). The red velour interior is large enough for congressional hearings but seats just two in deluxe comfort. Power windows and locks add to the luxury feel; such heady gadgetry didn’t appear as standard until the launch of the Silverado in 1999. 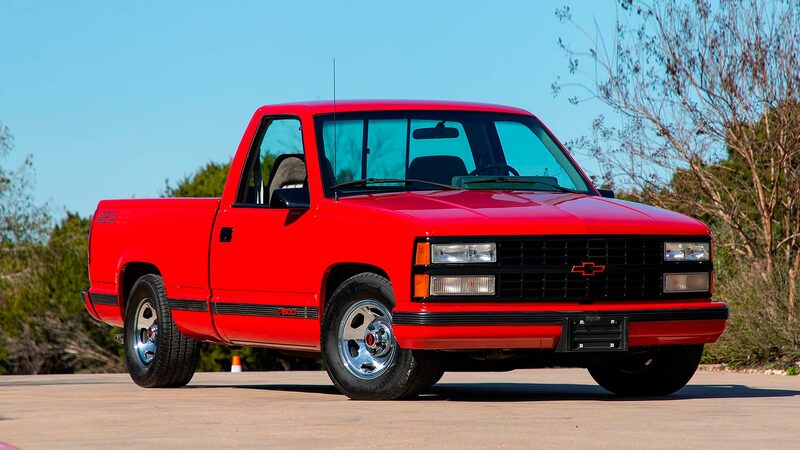 1992 was the first year for Victory Red, and the color was so invigorating it inspired the previous owner of this Chevy rocket to upgrade the engine to over 600 horsepower. To match the sound of the custom exhaust, a custom sound system was installed. The truck was also lowered, because why not. This example has seen 50,737 miles. Just 4,270 Lightnings were produced in 2003, and No. 2,243 here is one of just 1,036 to sport black paint. This all-original example has had just two owners since new and covered a mere 25,943 miles. The sale includes the window sticker and original documents, SVT certificate, CarFax report, and an extensive receipt history. This one-owner Oxford White Lightning has just 11,775 miles on the clock and is still shod with the original tires. The interior is picked out in Medium Graphite. 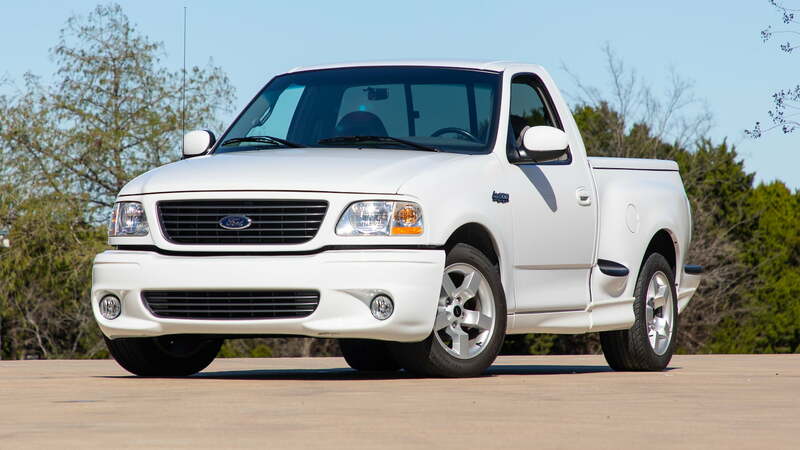 2001 saw a power bump to 380 horsepower and 450 lb-ft of torque, up from 360 and 440 for 1999-2000 models. Sintered rods and a forged crank allowed a 5,250 rpm redline, with the fuel shutoff at 5,400.